The Brazilian and I went to the Royal Botanical Gardens, Edinburgh. 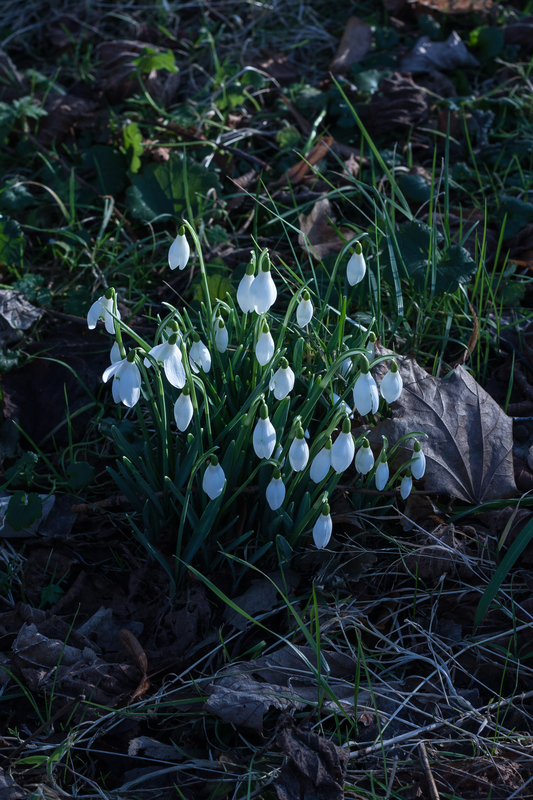 We went primarily to view the snowdrops. They were beautiful, although not as plentiful as I imagined they would be. 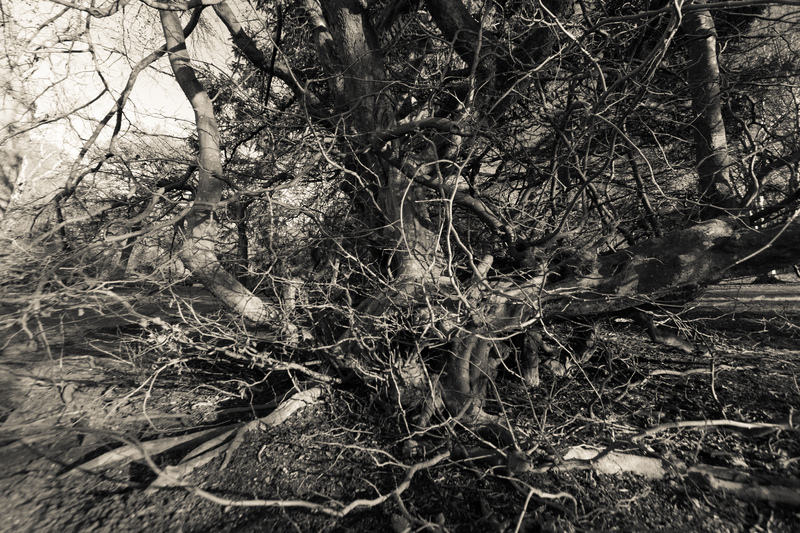 They clustered under the trees and in among the grass. It was the most beautiful winter’s day imaginable. A deep blue sky, and even some warmth. 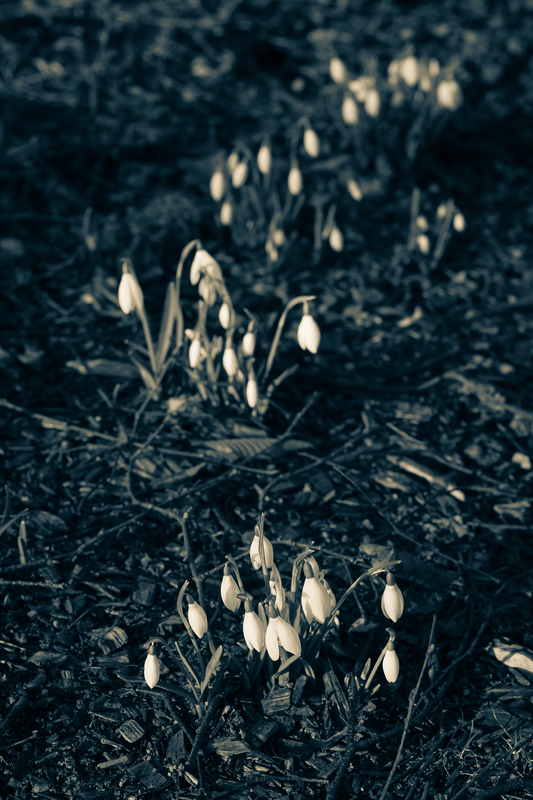 The snowdrops were not the only starring bulbs. 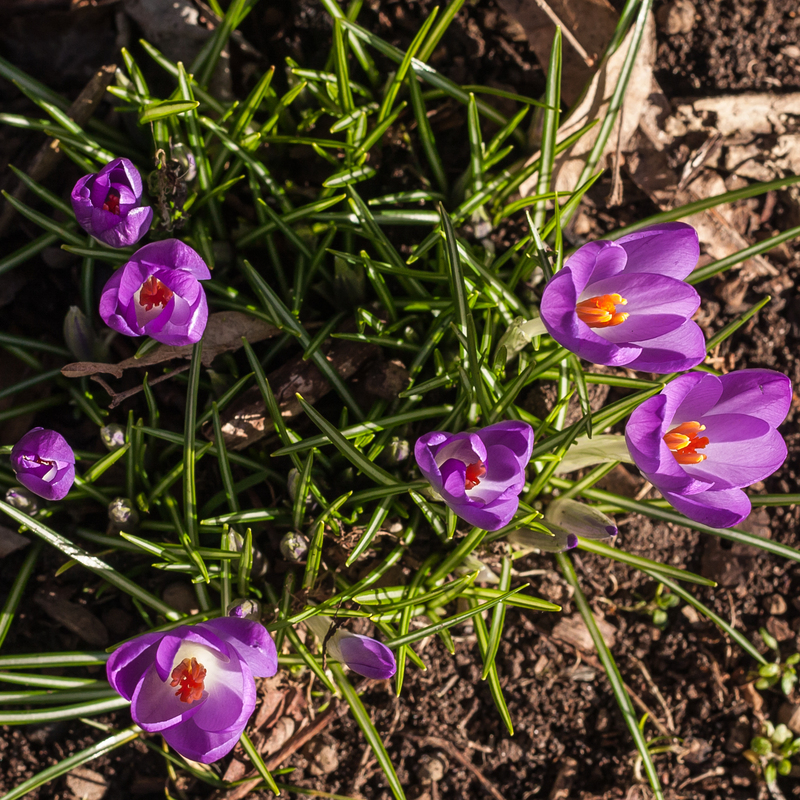 A handful of crocuses had come out too on this spring-like day. 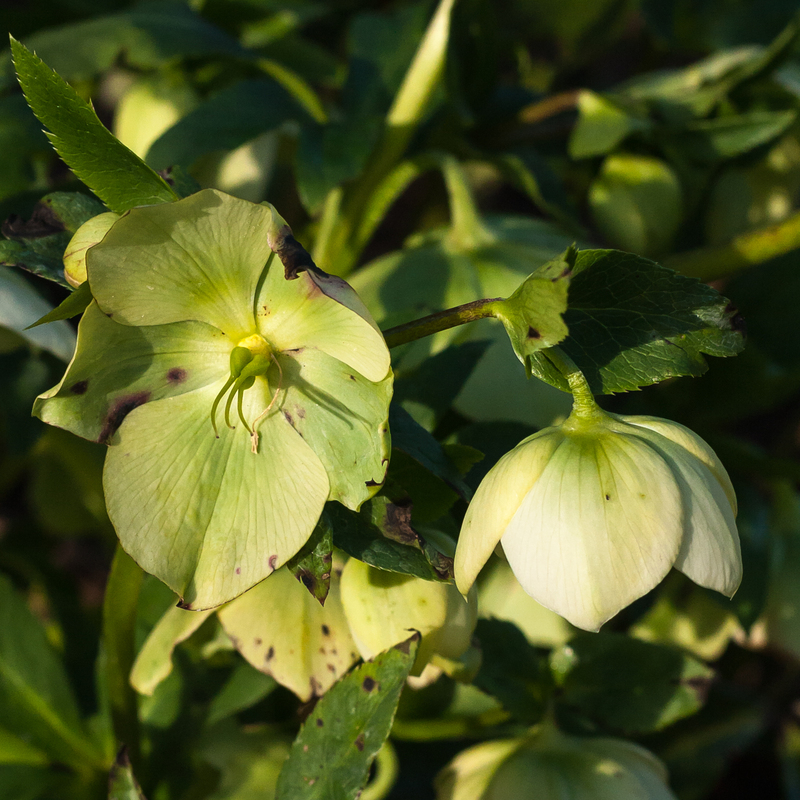 Naturally there were plenty of hellebores. 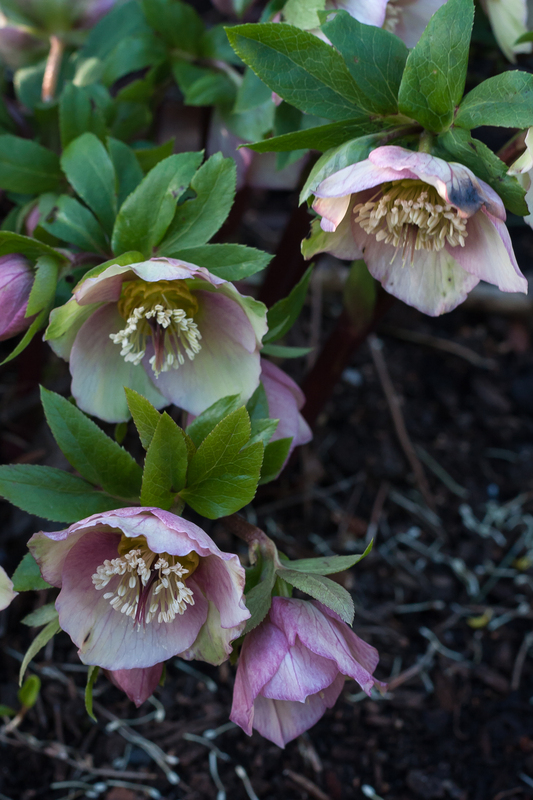 Hellebores are one of my favourite plants, and I was interested to see the many different types they had in the Botanical Gardens, such as these H. orientalis. The Garden looked impressively green for this time of year. 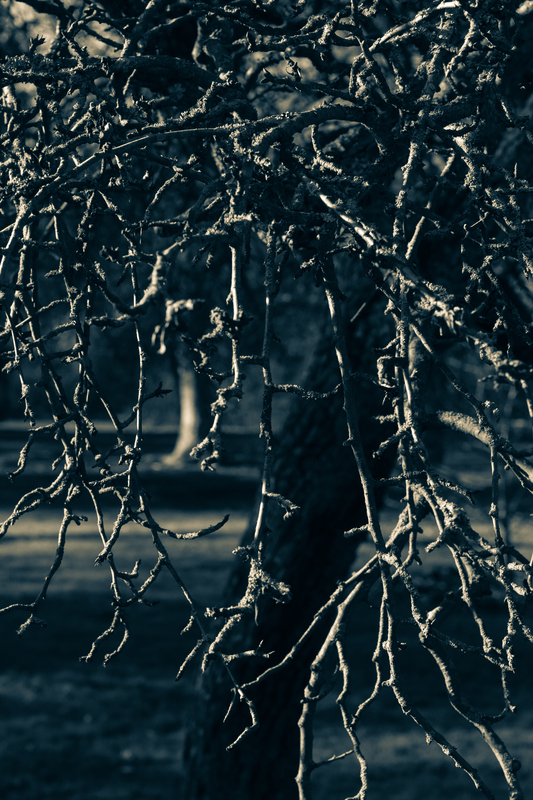 Sun-starved Edinburghers wandered dementedly through the luxuriant light. 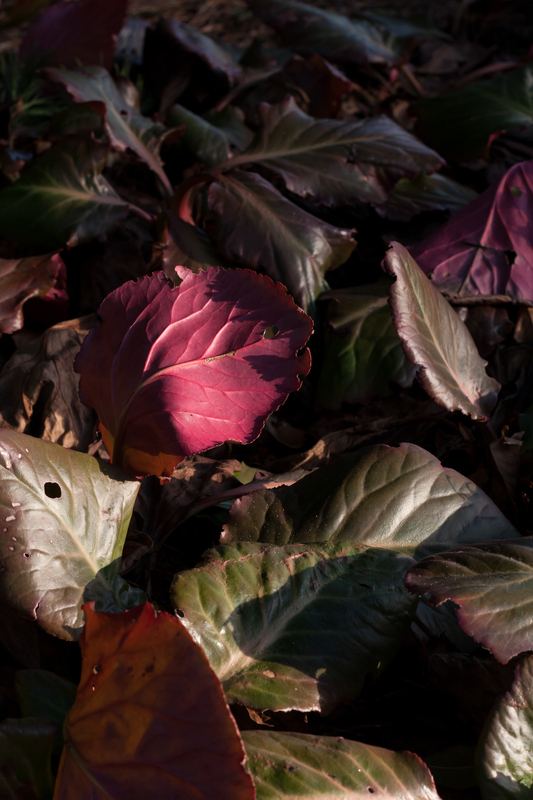 … like these beautiful Bergenia ‘Margery Fish’. 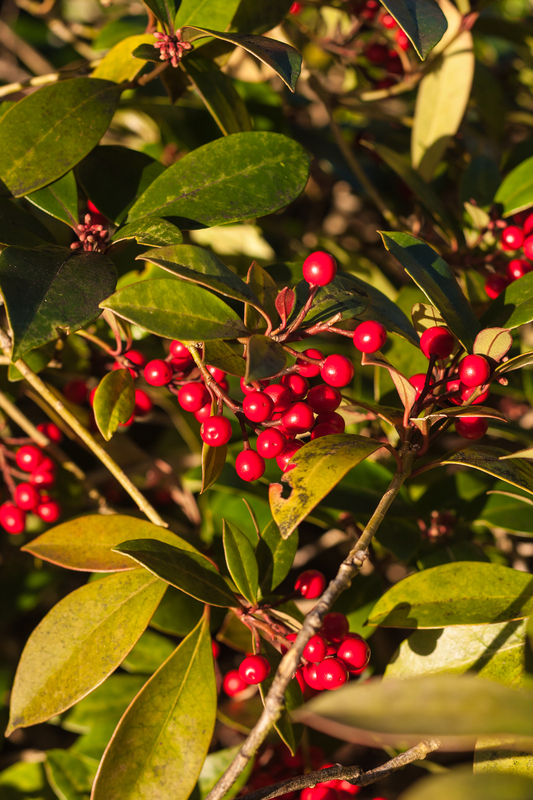 … and berries galore (Skimmia japonica reevesiana)…. 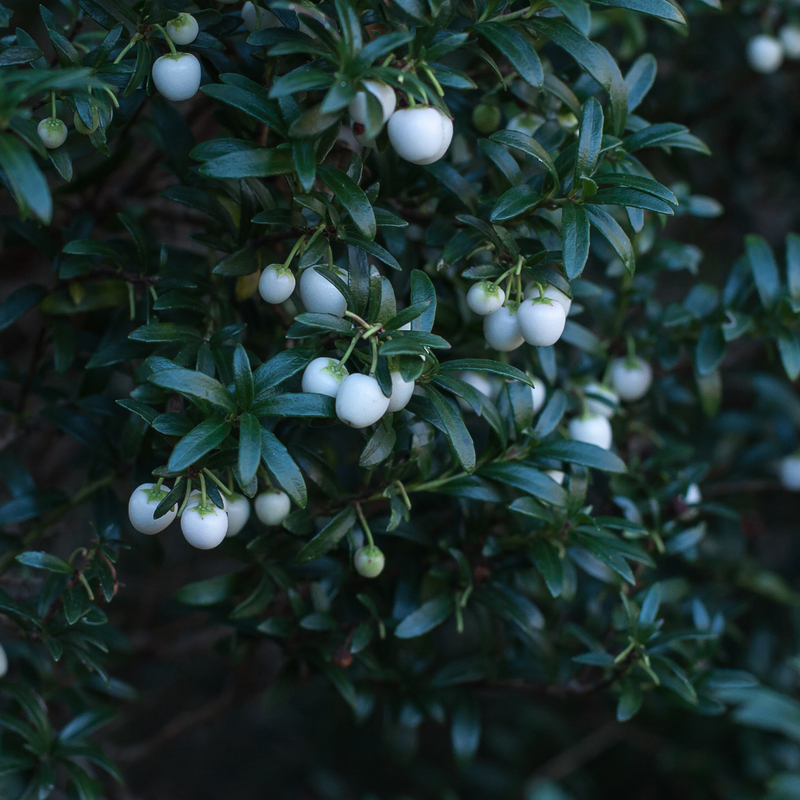 … and galore (Gaultheria poeppiggii)…. 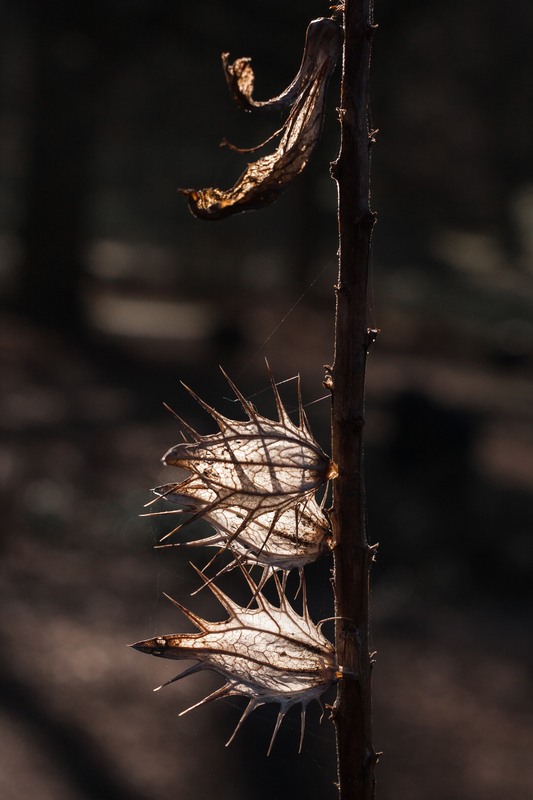 But even more fetching were the dried stalks and seed heads, all that remained of glorious summer past. 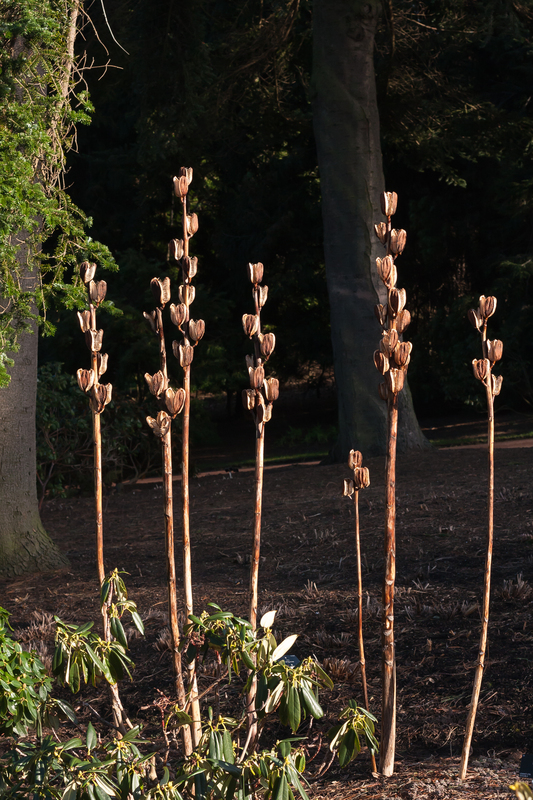 These spiny structural remnants had no name beside them, or I’d have ordered some for my own garden. 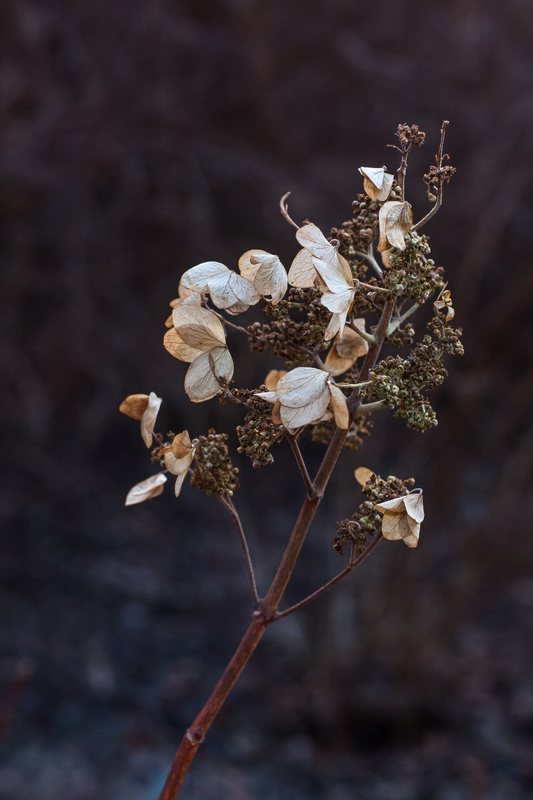 Old dried hydrangea flowers with their pearl-button petals are another favourite of mine. This diamond bark reminded me of a baked apple lattice. While this ancient old Parotia persica resembled a mad old bag lady. 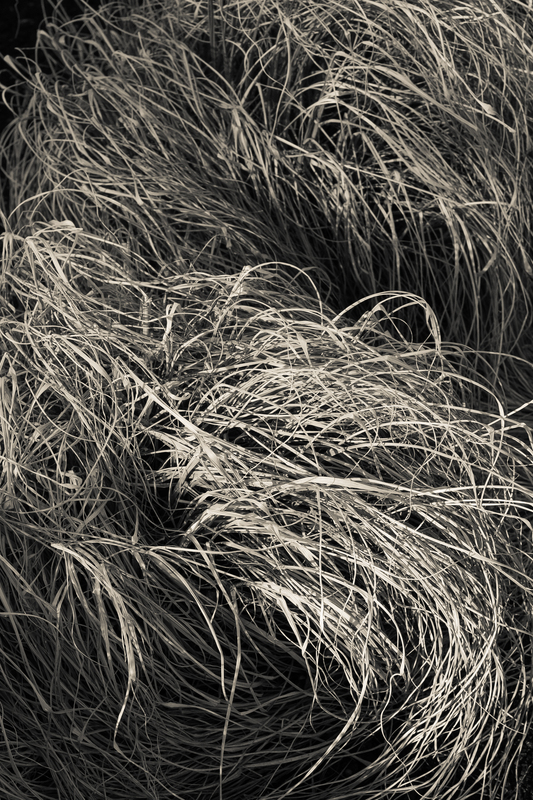 And these dead grasses looked like wild blonde hair. 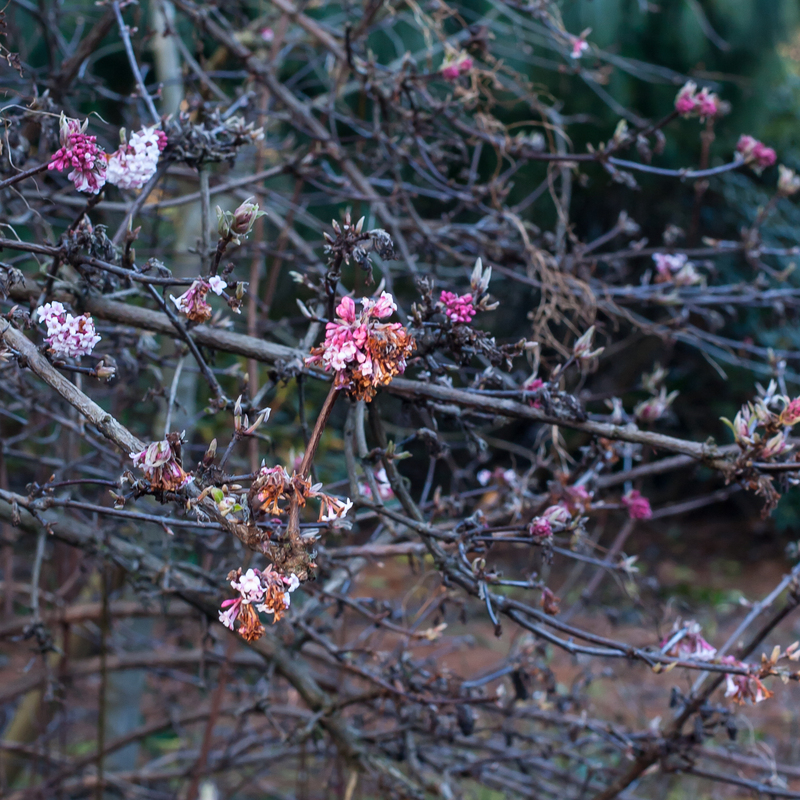 I adored the many viburnum (viburna?). 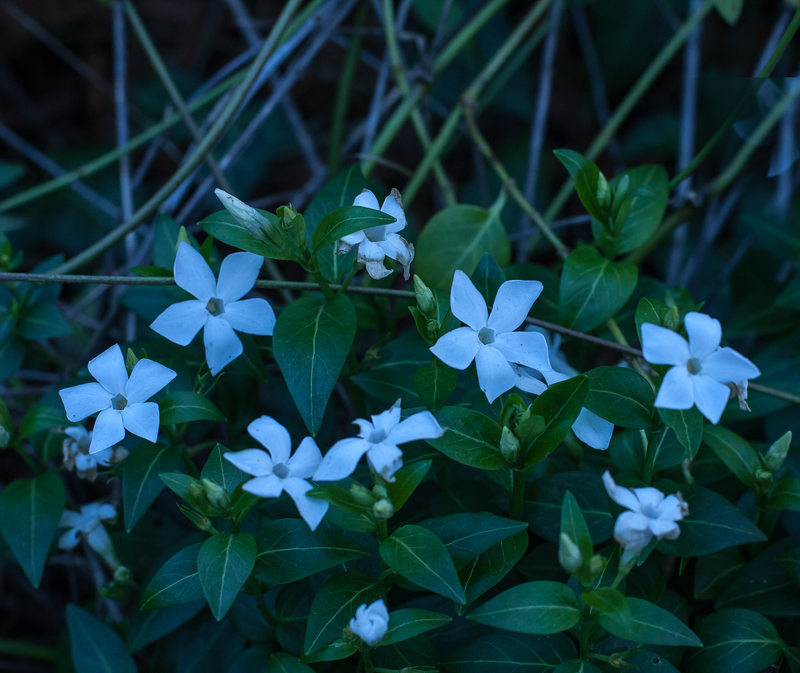 These pretty stars belong to a Vinca difformis. 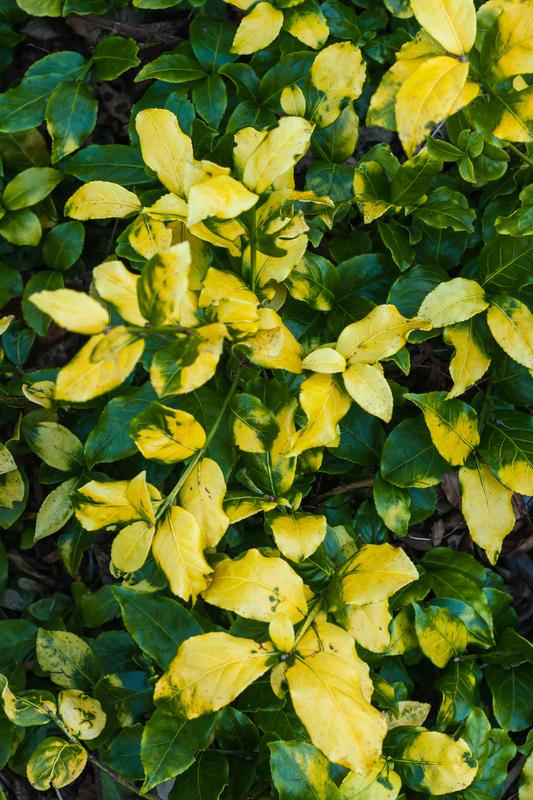 Did you know that alkaloids from Vinca species are an important treatment for some types of cancer? 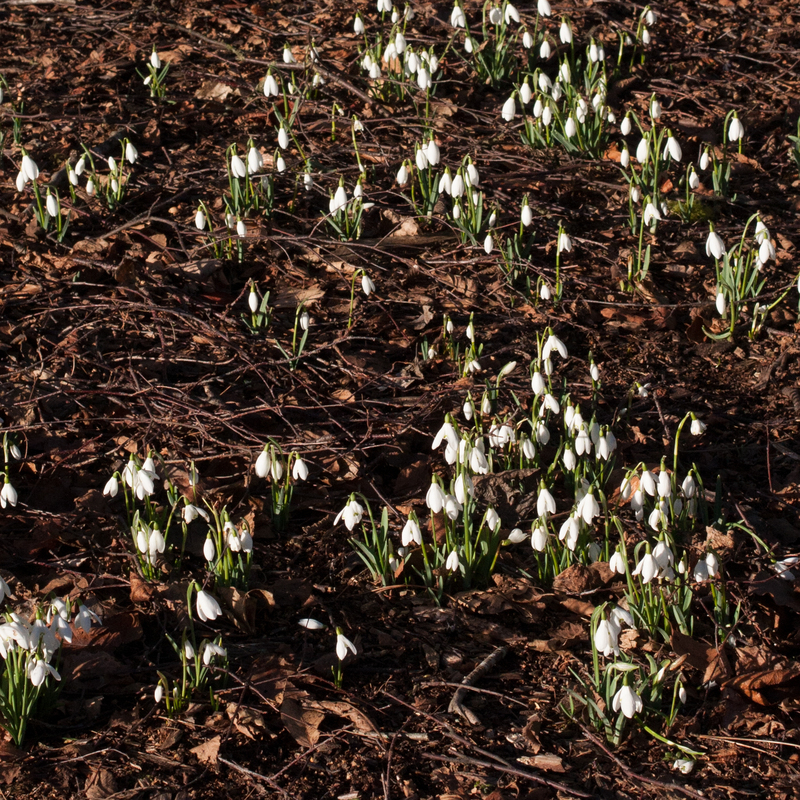 …and more snowdrops. Since we’ve touched on the subject of botanical pharmaceuticals, Galanthus species are the source of galantamine, a drug used in the management of various types of dementia. 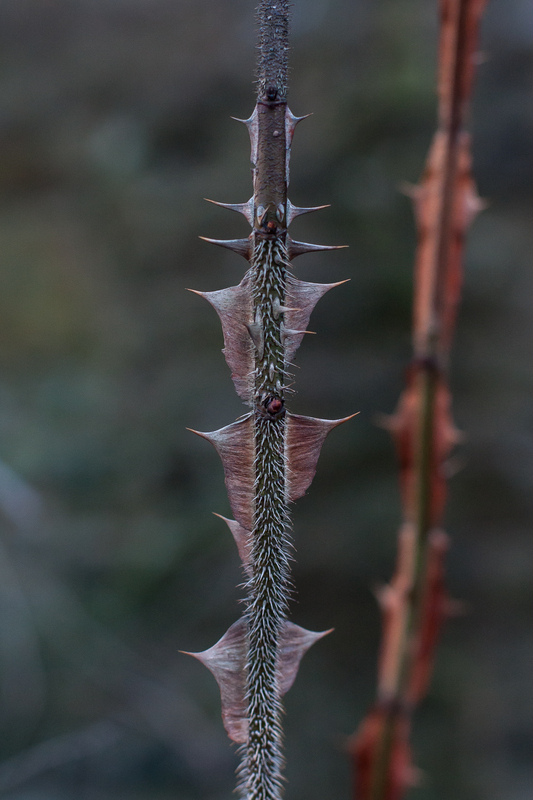 This wicked looking Rosa sericea omeiensis comes from China. Parts of it look like the perimeter fence of a high-security unit. 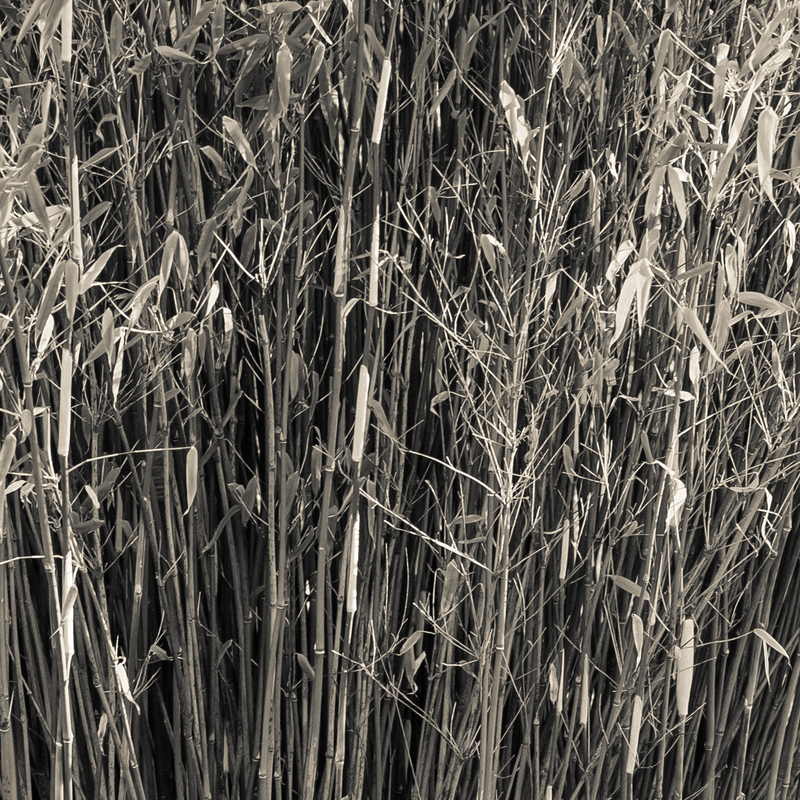 Although I’m not much fond of bamboo in gardens, the stripes on this one were so interesting to photograph. 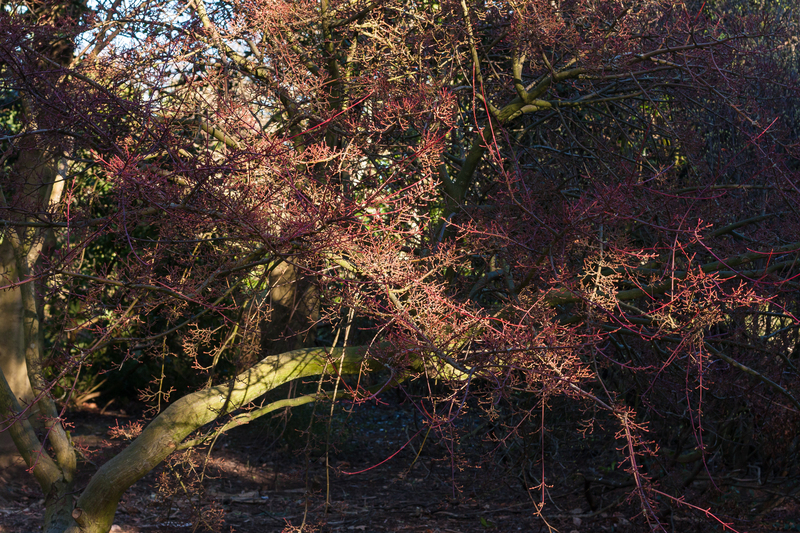 And I loved this hazy scene of intricate red branches lit up out of the shadows here and there by sunlight. 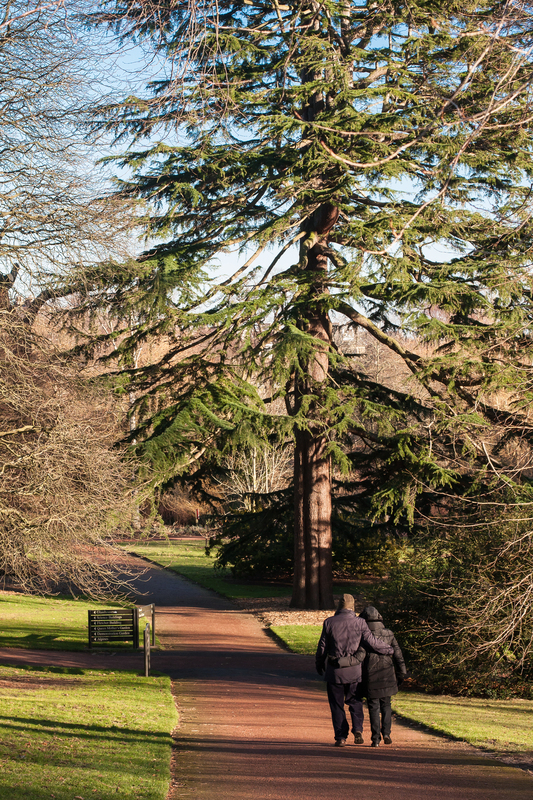 I’ll be back as often as possible with further reports on what’s blooming, springing, swaying, sprouting and bursting throughout the year at the Royal Botanical Gardens of Edinburgh. Lovely photographs. 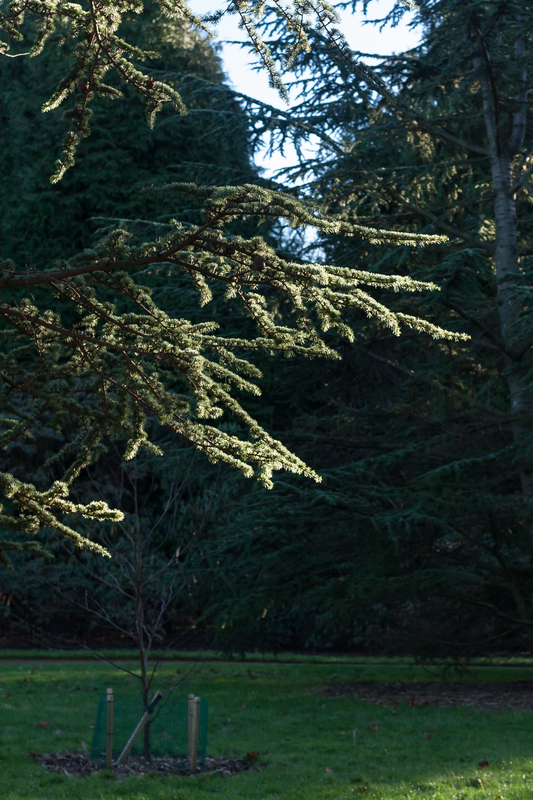 I have been to Edinburgh Botanical Garden and I think it must be wonderful to live close enough for regular visits. 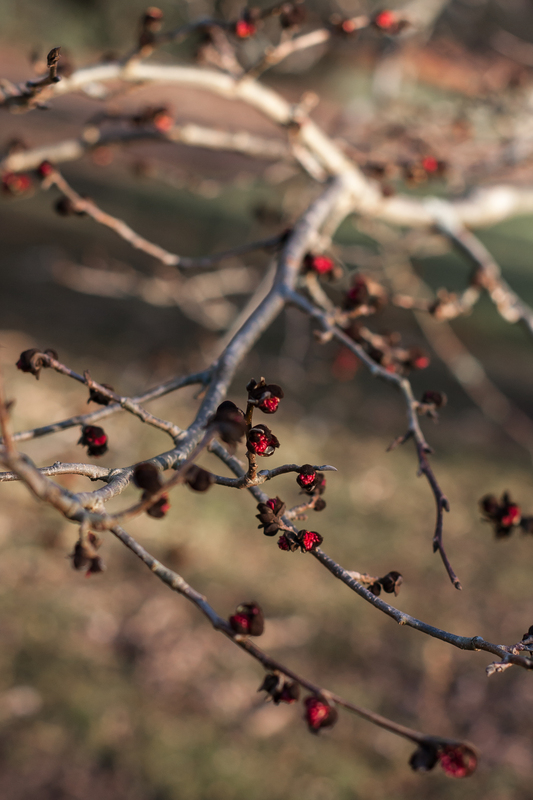 Your second photo of berries, looks to me like the tufty little red flowers of Parrotia persica just emerging. Well, you are absolutely right. 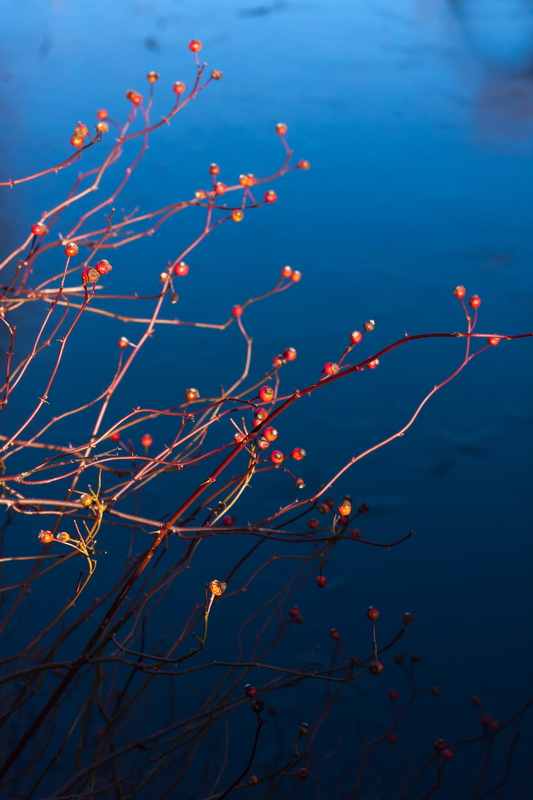 It IS a Parrotia persica, and I had no idea they were buds, not berries. Thank you very much for setting me right. I’d agree with Chloris – was about to ask you if you had seen the label! I love the Botanic Garden in Edinburgh. Although I once spent 4 very boring weeks weeding on the rock garden, so not all my memories are good. But the view was unsurpassable! 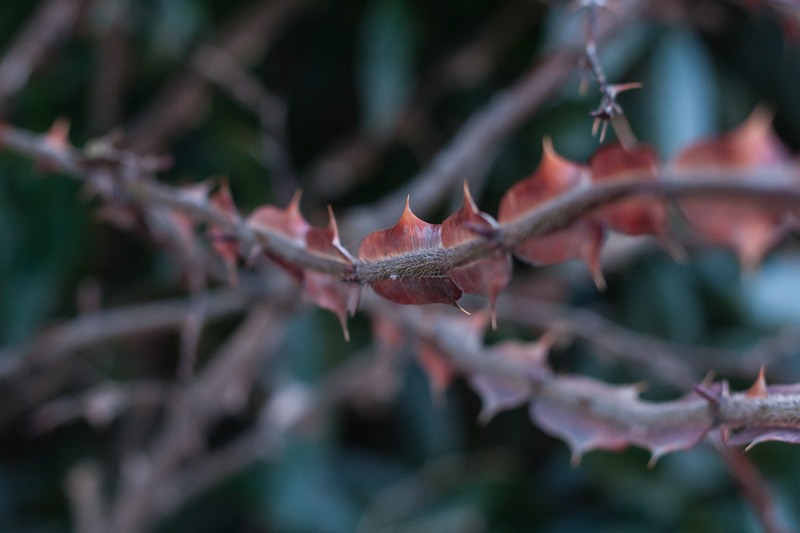 They are lovely pictures – I really enjoyed the dried stems and the way you captured the Rosa sericea. A very pleasant ‘virtual’ return! What knowledgable readers I have. It is indeed Parrotia. 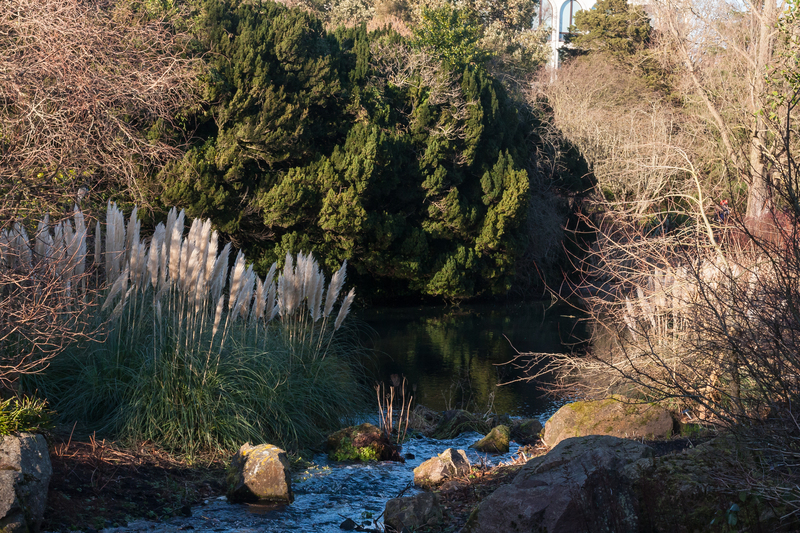 The view from the botanics across the city is simply wonderful on a clear, sunny day. Thank you for your kind comments! And thank you again for your lovely pictures! I really enjoyed this post, especially since I am just back from Edinburgh. I was helping my daughter shop for a new flat and didn’t get any time for walking round gardens, so I was really pleased to see what I missed. You have taken some lovely photographs. 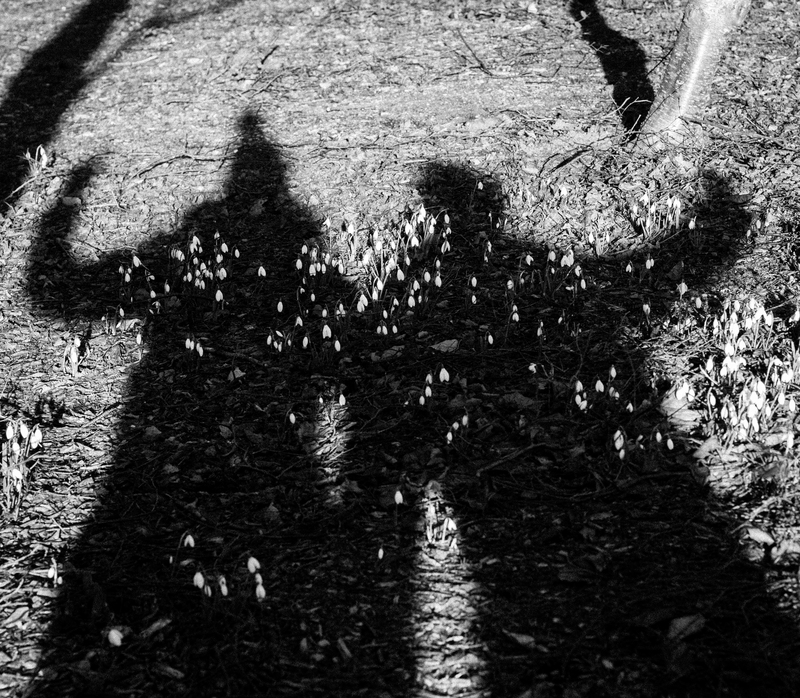 I really like the snowdrops in the shadows and the spiky photos. Thanks Annette… It’s a wonderful city to live in so I hope your flat-shopping trip was successful for your daughter. Oh sorry, it did read like that didn’t it. Actually she already has the flat – well almost! We were shopping for furniture to put in it. We know Edinburgh fairly well as two children were lucky enough to go University there – my daughter is now working there and has decided to buy. I do hope it will make her stay for a while anyway as you are right – it is a wonderful city. 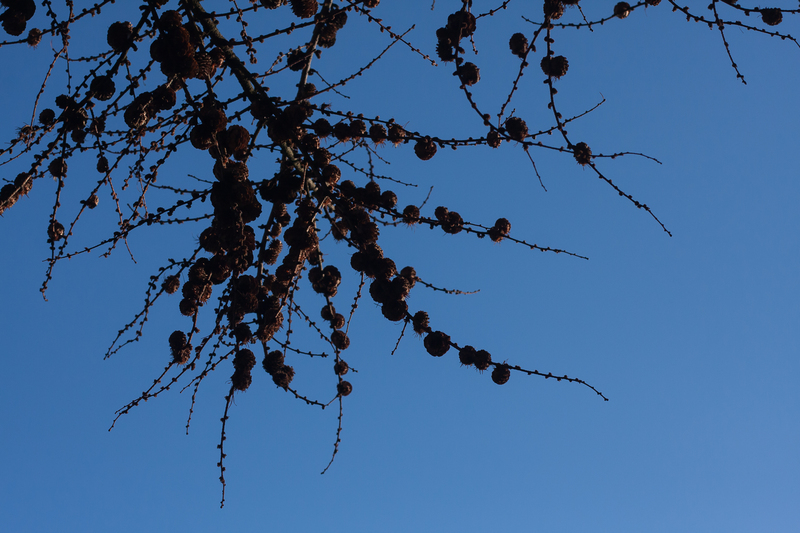 I thought the Parrotia buds were berries that had been well pecked-at. 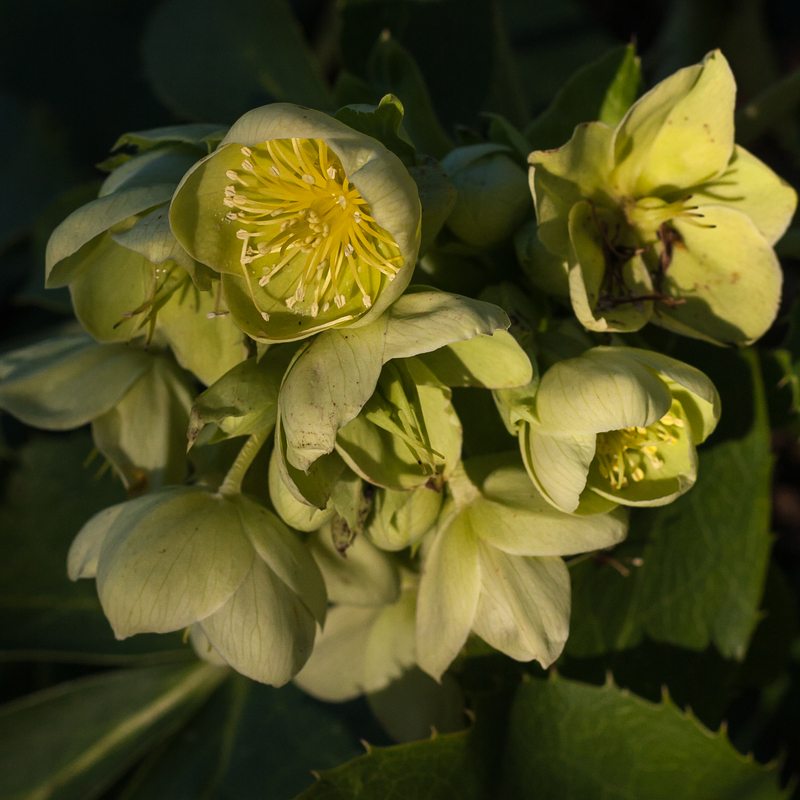 Can you go back and photograph the flowers when they have opened? Also have you any idea what the dried stalks and seed heads are? They are quite magnificent. I’m hoping someone will enlighten us both as to the spiny structural remnants. I’m interested to see that like me the Botanics haven’t dead-headed their hydrangeas yet. When you next go there keep an eye open to see when they do it; there is a school of thought which says the old heads should be retained to protect the new buds. But for how long? 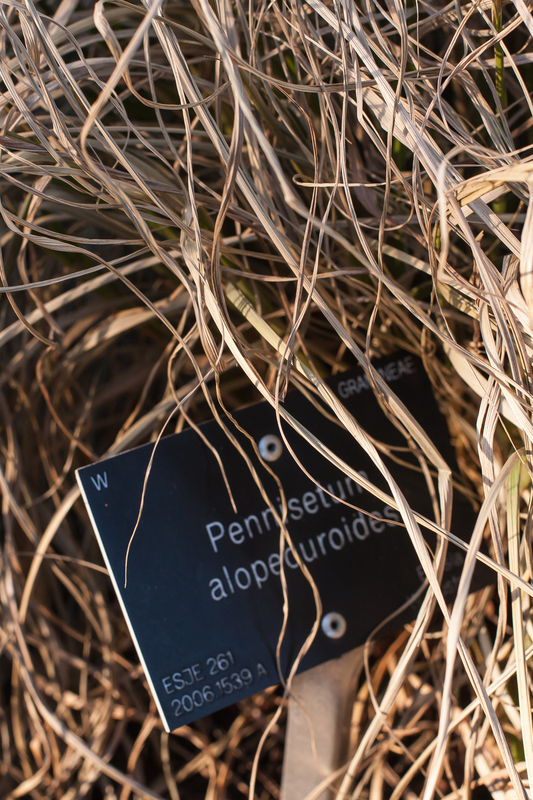 Afraid the spiny stalks had no label, and the very tall straight ones had a label but it was so far away that I would have had to walk on the flower bed to get close enough to read it. I know you’re supposed to keep the dead hydrangea heads on, but not sure for how long. Every garden in South Edinburgh has a hydrangea with its brown flower heads firmly attached. 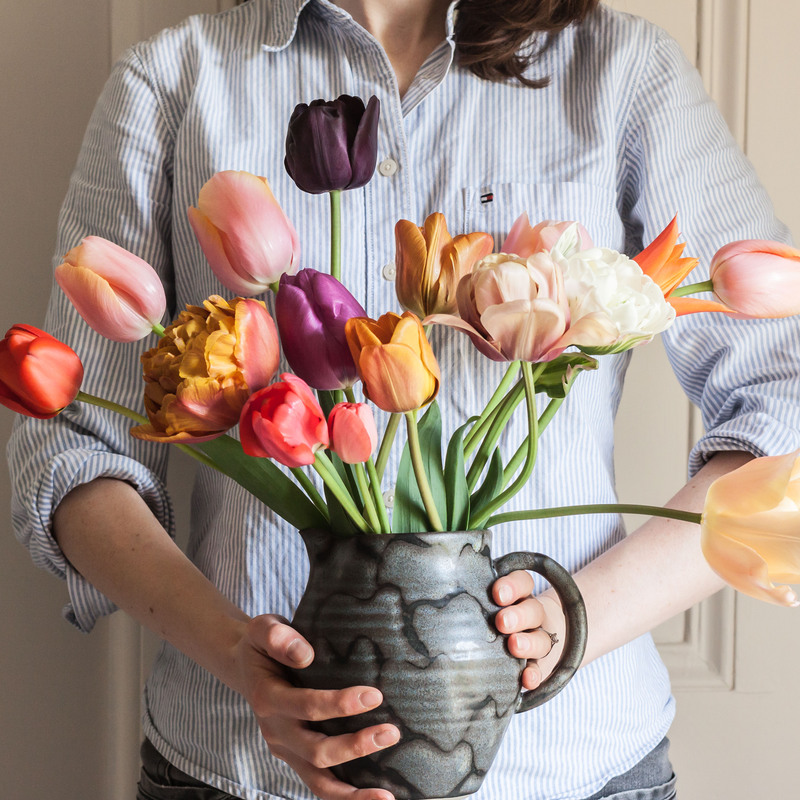 I decapitated mine in autumn, as you know, and the dried flowers are still decorating our flat. What beautiful photos! I will look forward to all your future posts about the gardens, having visited there several times before, while living in Edinburgh. At that time I was no gardener, so will be enjoying it through new eyes! 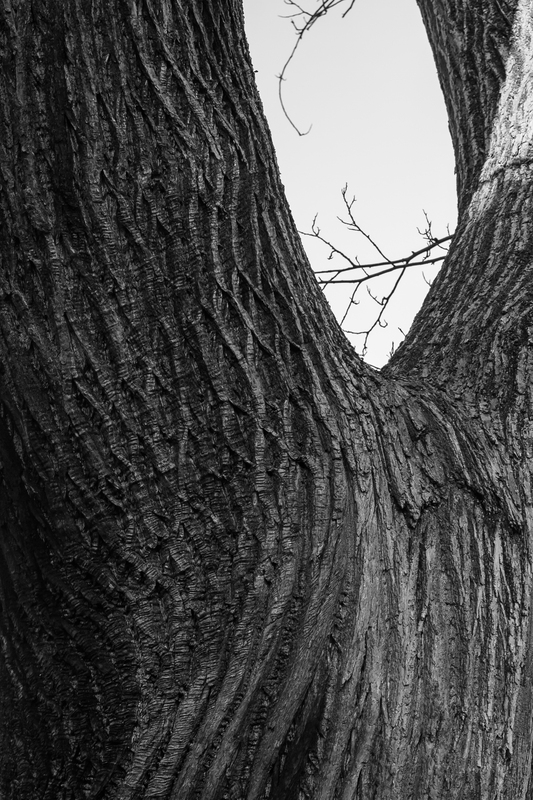 Nice to see shots of bark and twig patterns as well. I deadhead my hydrangeas in the spring tidy up, when new green shoots start emerging further down the stems. I believe that to be the right thing to do. And you have the beauty of the seed heads all winter! A lovely set of images. You found masses of beautiful things to enjoy. You are lucky to live so close to the garden to be able to visit often.